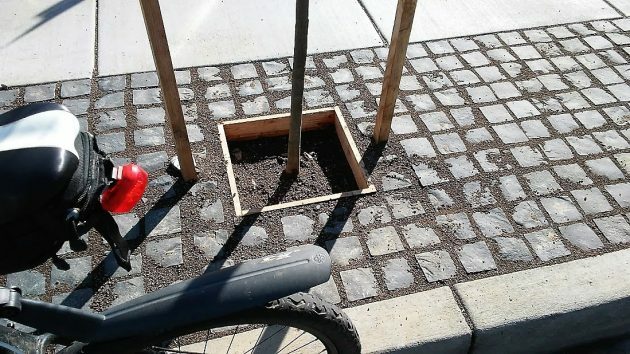 I wondered whether the frames were intended to answer the complaint that some of the more than 200 new street trees in the downtown project had been planted too deep in the ground to thrive. No, that’s not it, City Engineer Staci Belcastro assured me. The contract for Phase 2 (the main part) of the streetscape project called for 224 trees to be planted, at a price of $780 each for a total of $174,720. The contract also provided for installing new 210 tree wells. (I guess 14 of the new trees went in existing spots.) At the bid price of $2,200 each — including pavers, sand and presumably the cedar frames — the tree wells came to $462,000. What else is new with the streetscape project? At Monday’s city council work session, Councilman Bill Coburn brought up the steel plates covering trench cuts in Ellsworth and Lyon streets. He urged the city staff to get the contractor to put down additional asphalt at the edges to lessen the jolts that motorists have been feeling. ODOT is scheduled to repave those two legs of Highway 20 this summer. City Manager Peter Troedsson gave the council an update on the streetscape project last week. Furnishings including trash cans, benches and bike racks have arrived, he reported, and the cans were to be put in this week. The benches and bike racks will wait until paving and striping is complete later in the year. On the money front, Phase 1 of the street and sidewalk reconstruction (around the post office, completed last winter and spring), cost $1,036,000. Phase 2, now winding down except for paving, is expected to total $8,786,000. That puts the streetscape total at $9,822,000, or $1,215,800 under the budget for both projects of $11,037,800. $780.00 A TREE? WOW!! I’d love to see the breakdown on that invoice. I am also surprised by the cost for the trees and would be interested in understanding how that cost is broken down. I wonder why we don’t ask for volunteers for these kind of projects (tree planting). We have a lot of amazing community resources for the expertise and I’m sure community members would be eager to be a part of the downtown project. Depends on the type of tree and the maturity of the tree. But you’re probably looking at around $200 a tree. Then there is the cost associated with the tree with includes delivery, labor and materials. Looking at the photo…that’s a two-person job. They will have to remove the brick, dig a hole, plant the tree, add appropriate nutrients, firm the hole, add in the frame and braces, secure the tree and clean up. That’s easily 2 1/2 to 3 hours per a tree. And let’s not forget…this is a government contract and even if the contractor didn’t pad the bid (it IS government work), there are costs they have no choice on, like labor, because the government requires ‘prevailing wage’. As an example, I used to work for a mason. We normally paid our general labor workers $6.00/hour (minimum wage was $4.25/hour back then), but government work required that we pay them $8.00/hour. In additional to increasing our gross labor costs, it also increased our payroll taxes and worker’s comp…the latter is based on gross payroll. Honestly, I don’t criticize all that is down with tax money, but $780 per tree plus $2200 per tree well? Trees are wll under $100 dollars at Tom’s or Garland or any other nursery in town. Surely they can be bought and installed for less. It may be too late for this project, but for future projects, how about writing the contract so that the wells are prepared for trees, but let the installation be done outside the contract by less expensive means.